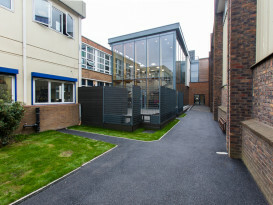 The learning hub was officially handed over to the school on Monday 7th September. 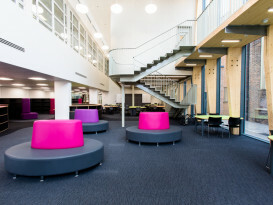 The hub is an extension to the existing library providing additional teaching and resource space. 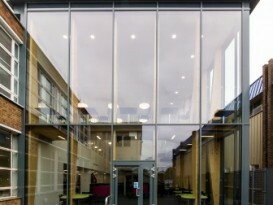 Alternate columns to the existing frame were removed to create an open space between the existing library and the new hub at ground floor. Supplementary steel frames and foundations were required preloaded with flat jacks prior to the removal of the existing columns. 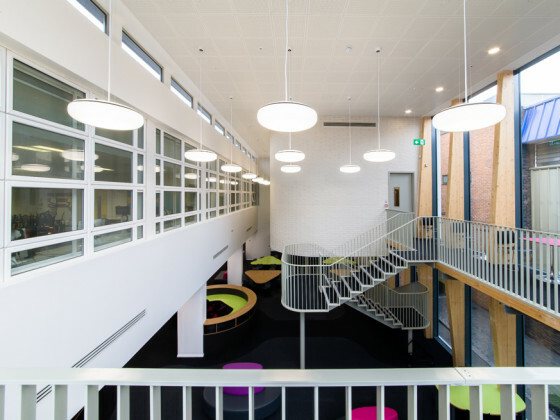 The hub also houses a conference room at first floor; and a gallery around the perimeter at this level provides inspiring study space overlooking the library below. These are accessed from a bespoke central staircase fabricated in steel using flat plates to achieve the slender profiles demanded by the design. Finite element analysis was used to determine the exact stresses generated allowing us to provide minimalist details. The extension’s superstructure comprises a steel frame supporting the conference room and audacious double height glulam mullions are used to support the gallery, façade and roof. Cross laminated timber (CLT) has been used thorough the 1st floor in the conference room and the gallery. 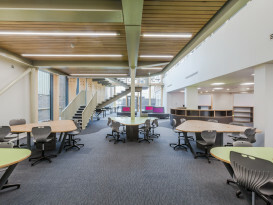 This hybrid combination of the lightweight steelwork, glulam and cross laminated timber using the latest analysis methods have allow us to create an inspirational space for the learning hub.